Woodhorn Museum celebrates the rich history of coal mining in the Northumberland area. For more than 80 years it was a working coal mine, but since 1989 it has been operating as a museum, educating and entertaining children, families and adults about life and work above and below ground in these mining communities. 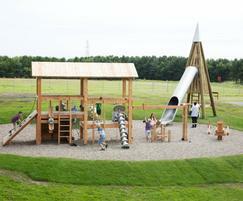 With children being a key demographic, interactive engagement is key to their offering, but with no formal play area, Woodhorn relied on the interactive exhibits inside. They secured funding from SITA Trust, Northumberland County Council and small grant schemes from County Councillors Val Tyler, Ken Parry and Jeff Gobin and invested in an exciting new play area which opened in time for the 2016 summer holidays. 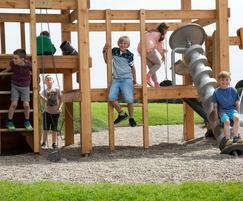 A pyramid tower with slide clearly identifies the play area, acting as an attention-grabbing focal point. Hard working pit ponies are referenced with a Swinging Horse, and a number of products have been combined to create a special mining platform with shovels, hoists and wheels and an Archimedes screw. This piece has been sited within a gravel pit, which is appropriate for the site, serves well as a safety surface but also delivers lots of play value. 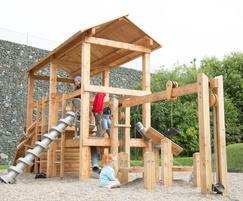 Landscaping has also been used effectively to add interest, with a play tunnel for intrepid miners to explore. 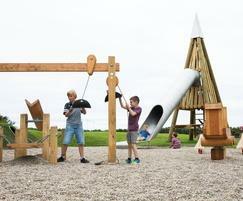 The play area has been very well received by museum visitors, attracting an increase in visitors from 2015. The museum have also seen an increase in secondary spend at the café. 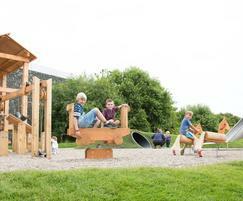 Jo concludes: “We are thrilled with the new play facilties supplied by Timberplay. 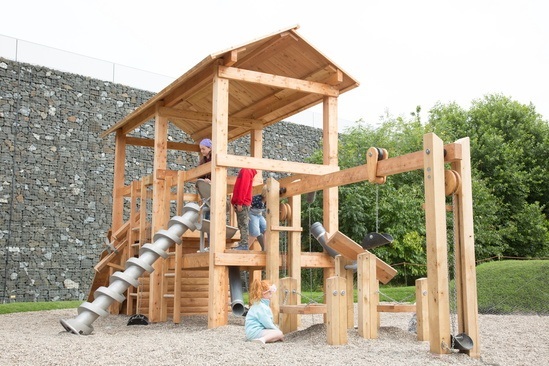 They are a wonderful addition to our family offering engaging children in play but with a direct link to the industrial heritage and nature of our site."